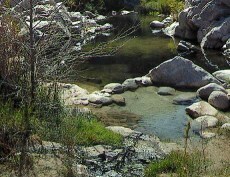 hot springs backpacking suggestions in the direction of Kernville? My girlfriend and I were planning to go backpacking this coming Labor Day Weekend to Jordan Hot Springs, but we just saw news stories indicating that the Fish Fire is in the area, less than 10 miles away from JHS and heading toward it. The fire is on the other side of the Kern, and unlikely to cross it, but we're not taking any chances. Anybody here have any good suggestions for alternative backpacking trips that would have us passing through Kernville on the drive back to our place in Pasadena? We were planning to detour on the way back from Jordan via Sherman Pass road and Mountain Highway 99 into Kernville, so that we could stop by the brewery, and maybe get in a soak at Remington Hot Springs as well on our way back. Hot springs destination would be awesome, but an all around cool three-day-round-trip backpack would be great too.